Bad things happen I ignore the rules of physics. In the chaos between coding and baking, I forgot the whole concept of things expanding or contracting when met with heat or cold. Kids, coding and baking don’t mix! Rather than the beautifully smooth spiced pumpkin cheesecake I pulled out of the oven last night, I am now the proud owner of what I dubbed Dinosaur Cheesecake. My local supermarkets only carry canned pure pumpkin in 28oz cans. It is better value for sure but rarely do I encounter recipes calling for 28oz of pumpkin puree. So after I satisfied my craving yesterday to greet autumn with a batch of pumpkin muffin, I was left with an unfinished can of orange pulp. 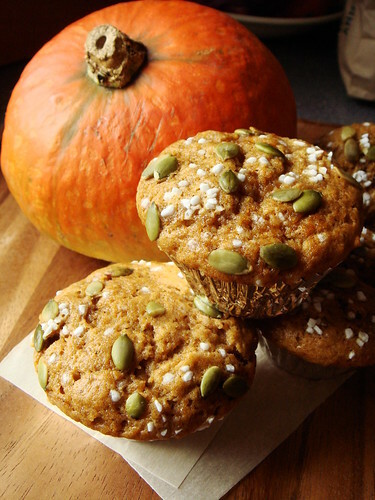 I wouldn’t mind it so much if I actually like eating plain pumpkin puree. Alas, I don’t. A double header of pumpkin dessert was my logical choice. It was not a tough decision when it came time to decide on a recipe. Blocks of cream cheese were on sale. 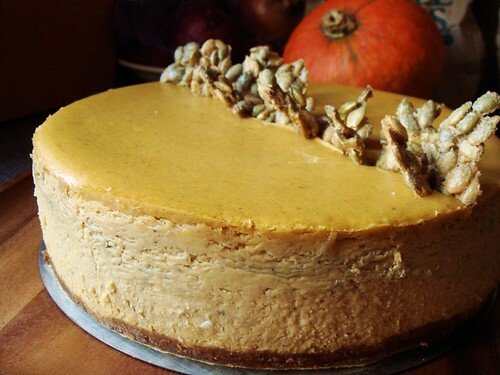 Spiced pumpkin cheesecake is both luxurious and seasonal. It was the kind of showstopper dessert I want to bring to a party tonight. I haven’t been blogging nor tweeting much for the last week with good reasons. Life has taken over with the passing of boyfriend’s long-time furry friend, racing the most important inline skating race which I had been preparing for since 2007, a busy time at the day job, and of course being on the road from one race to another. In short, I rarely have time to sit down quietly to even collect my thoughts much less doing any quality cooking in the kitchen. I really miss those quiet yet productive evenings when my hands were occupied with chopping vegetable, weighing butter, stirring sauces, ladling jam, and washing dishes. Despite all that chaos swirling around, I’ve done a lot of thinking regarding my future as an amateur athlete. I always thought after achieving a goal I held dear for the last five years, I would be too exhausted to continue this lifestyle. It was not the case but for very unexpected reasons. Rather than feeling joy and satisfied of my achievement, I am filled with relief and a mix bag of negative emotions. I am definitely relieved that I delivered what I promised so many years ago. However, the race also made me see my sport a little different and clarified my perspective of what role I play. In short, I will continue to compete for another season and that means another year of very hard work. Life is punctuated with episodes of loss. It was close to a decade ago when I experienced the greatest loss I could imagine. When I see boyfriend’s sadness, it triggers so many memories I careful hide away. The passing of a loved one always hurt so so much. This weekend I’m revisiting Brooklyn for my annual New York City trip. The purpose of this trip is an endurance race of 100km in Prospect Park but it is also my best excuse to eat a large amount of really great food in one of my favourite cities. I have a whole list of old favourites and new places to explore. I can’t wait to share my travel experience with you soon (if I don’t disintegrate in the rain)! As an avid baker, I am not afraid of complex recipes calling for long list of ingredients. In fact, it is to be expected. It puzzles me that there is a whole niche of cookbooks focusing on cooking with five/four/three or fewer ingredients. Where is the fun? It’s no wonder I looked at the Cinnamon-Crunch Chicken recipe with skeptical eyes. This recipe from Dorie Greenspan’s Around My French Table promises a glimpse of modern French home cooking by transforming a handful of common store bought ingredients to unexpectedly elegant dishes. The three ingredients are skinless boneless chicken breast, crème fraiche, and speculoos (cinnamon flavour butter cookies). 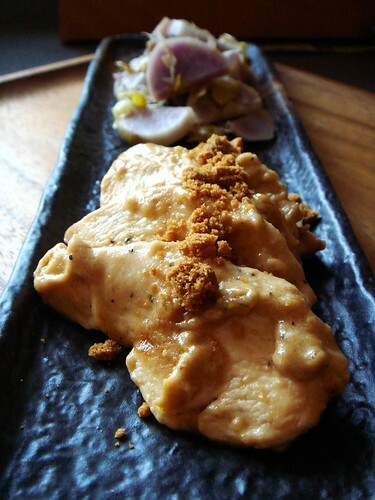 The transformation is pan seared white meat coated in a thickened tangy cream sauce dotted with crunchy bits of crumbled cookies. So did this dish change my skepticism? Vegetarian In Denial is the latest moniker that a friend has given me. I always protest in return because I really do eat meat, just perhaps not as frequently as expected of an omnivore. Take last Sunday for example. After an easy bike workout, I was craving fiercely for something meaty so I naturally reached for a pickled herring fillet wrapped around a pickle spear. The vinegary fish sure hit the spot! Having said that, on most days, my natural leaning is very vegetarian friendly. Shortly after downing that juicy pickled herring, I made a dinner of roasted vegetable and fresh mozzarella sandwiches. 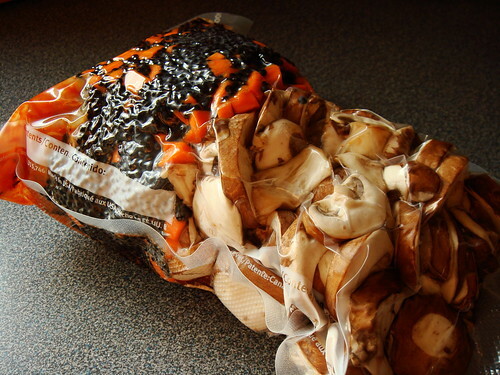 The deeply vibrant vegetable was a feast to the eyes and the mouth with the sweetness brought out by roasting. 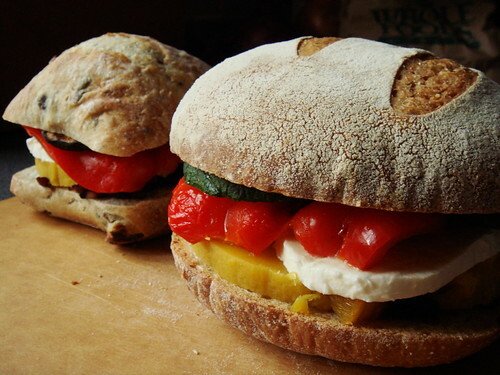 The fresh mozzarella slices were creamy and rich to balance the rustic crusty ciabatta rolls. The piece de resistance? A slick of spicy red onion jam that tasted of sweet onions, smoky chipotle, and tart balsamic vinegar. Now that’s what I call a balanced meal! Despite the massive number of bananas yesterday’s recipe consumed, I had more. 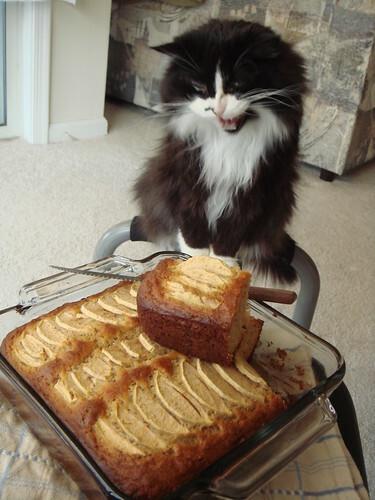 No more banana bread I say! I crave something super decadent and comforting because I’m under a lot of stress in recent times. My normally disciplined diet is quickly dissolving into a feast of chocolate and cookies. Yikes! I was flipping through Flour: Spectacular Recipes from Boston's Flour Bakery + Cafe and the recipe for Banana Chocolate Bread Pudding called out my name. 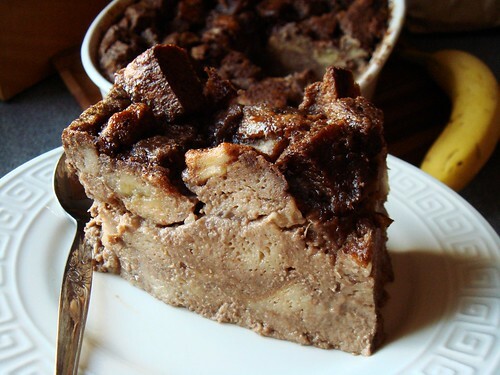 A bread pudding made with milk chocolate custard and studded with creamy chunks of bananas? That’s exactly the dessert I wanted to bake to sooth my fraying nerves. Sharp-eyed reader may notice that I wrote “to bake” rather than “to eat”. You see, eating a decadent dessert is an experience that lasts, well, 15 minutes at most. Whereas working with butter and cream and chocolate and sugar to create a rich dessert is a tactile experience that can keep me occupied for hours if I savour the moment. This is the reason why I often choose to bake when the going gets tough. One of my souvenirs from racing Montreal 24hr Relay on Labour Day Weekend was 14 bananas. You see, my team took advantage of the case special and bought 40lb of bananas to share among 20 skaters. That works out to 2lb of bananas per person to consume within 24 hours. When was the last time you ate this many bananas in one go?! As can be expected, leftovers were aplenty and so 14 of them came home with me enduring 5 hours of driving from Montreal to Toronto. I’m pretty sure I could have taken more and nobody would complain. 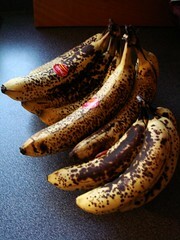 One small problem was that they all ripened at the same time. Instead of a steady supply of yellow bananas for a week’s worth of breakfast, I had a whole fruit bowl of spotty bananas begging to be turned into some kind of baked goods. 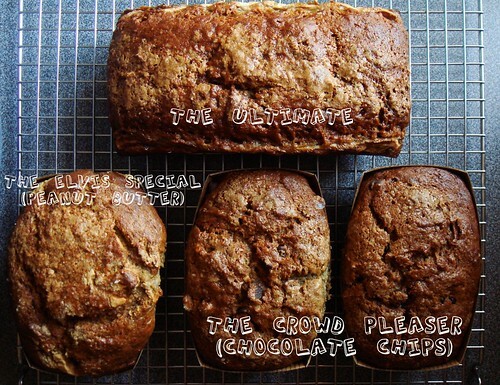 Last month, America’s Test Kitchen Feed hosted a contest for baking their Ultimate Banana Bread. I bookmarked the 6-bananas recipe (!!) but never got around to entering the contest. It was exactly the recipe I needed for my banana surplus situation. Yesterday I revealed the content of Bake Sale for A2A regular cookies assortment without one single mention of the vegan cookies assortment. It’s really an oversight on my part because I’ve been so caught up with the sheer amount of baking. I churned out 70 dozens of cookies from my home kitchen within the last week in addition to catering meals to 24 people for a sporting event in Montreal. Overwhelmed is an understatement. Having said that, I had the most fun creating the vegan cookies assortment. Due to the smaller batch size, I could let my culinary creativity run free without strictly following a recipe. 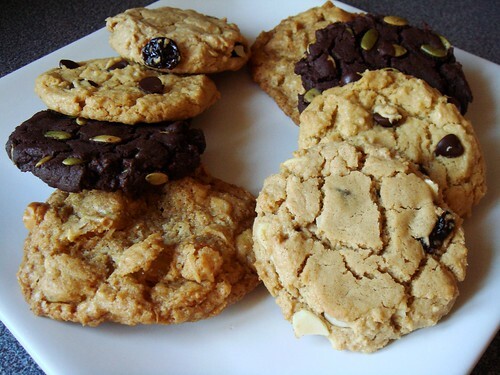 For the most part, my vegan cookies follow the template Dreena Burton uses in her vegan cookbooks. The base is formed by mixing flour and leavening agents using the quickbread method with a maple syrup vegetable oil emulsion. Add-ins are folded into the batter before shaping and baking. It’s very simple and does not require any specialty ingredients. The ease of this method meant I could bake batch after different batch very quickly as well. For this weekend’s delivery, I included four recipes showcasing various tastes. It’s been awfully quiet here at Dessert By Candy because I’ve been buried in cookies for the last few days filling out bake sale orders. Thanks to everyone’s generosity and appetite for cookies, the final tally for the fundraiser has topped $1110. You already know that I’m grateful for the outpouring of support so let’s move on to the more important stuff. What do you get for your $20 donation? First off, I have to inform you that there is such thing as Cookie Emergency and I’m here to address this serious issue. 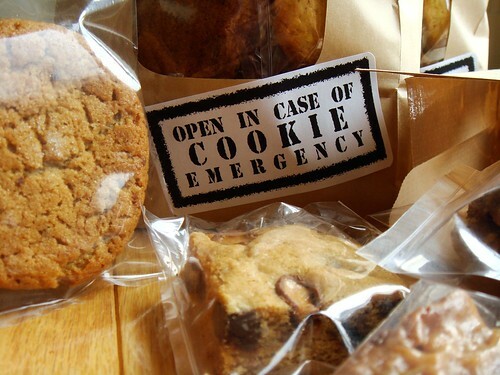 Each bag of cookie assortment contains your emergency ration with two of each kind in case you’re stuck in this dire situation with a friend. The cookies are sealed individually in poly bags to ensure freshness because even in an emergency, a stale cookie is a sad sight to behold. In fact, feedback from testers indicated this kit was able to withstand a whole night of pouring rain without affecting the precious rations inside! Not that I suggest you try…but a pair of scissors would be good idea if you want to enjoy the cookies without a fight.